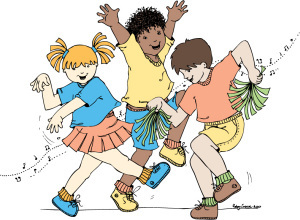 There are lots of handy hints contained in this section to assist you in providing positive, successful movement, music and singing experiences for young children. If you speak too quickly the children have trouble following your verbal cues or instructions. Young children's cognitive (thinking) abilities are not yet fully developed and the brain can't process the information as quickly and efficiently as it does as an adult or older child. Keep instructions short and simple. Again because of the young child's immature brain development the child cannot remember too many instructions at the one time. Generally children under 2 years can understand 1 instruction at a time e.g. "Can you now stand up". The children stand up..." Can you now clap your hands"...the children clap their hands. Children aged 3-4 can generally understand 2 instructions at a time e.g. "stand up and go and collect a scarf each". Children aged 5-6 can generally understand 3 instructions e.g." stand up and go and collect a scarf then sit back down again." Use correct grammar and call the props by their correct names. The children learn from you in everything you do and this is how they learn language and the names of things, items and objects. Be a great role model in your articulation of language! Sometimes we want to sound motivated and engage the children by being bright, enthusiastic and lively. This can lead us to sometimes become loud and exuberant which may actually come across as too overwhelming for the children and possibly then disengage them. You can still be animated but not too over the top with a loud voice and over bright actions. Don't patronize the children either...they will know! Use light and shade in your voice and often a softer voice draws the children to you because they want to hear what you are saying. If you want to get a point across lower and soften your voice and use lots of expression in your face and eyes. Often as adults we can shout over voices or noise, shout across a room to a child or group of children and all they hear is more noise! Shouting will actually make the children shut off and not hear anything you say at all and then the point or control you want to gain is useless. Be expressive in your body as well as your face and voice. Your whole body should be animated not just your voice. This will draw the children to you and they will enjoy the experience more (and so will you!). Children learn more effectively when they are "doing" something. Get them up moving and participating. Even if it is to get the children to sing a song standing up, lying down, and sitting on the floor or on a chair. Make it different and interesting! Remember children learn effectively when they experience things for themselves. Action songs are ideal as the children can move to accompany the words of the song. Smile as a welcome. Smile as you speak. Smile as you sing. Smiling adds joy to all you do. It conveys a non verbal message that "This is fun and I like what I do....come and join me." Other people can hear a smile in your voice when you speak and sing (You can also hear this when someone speaks on the telephone). Did you know that you use more energy and facial muscles to frown than you do when you smile? Smiling also sends "feel good" messages to the brain. The brain believes everything you tell it so you will begin to feel good about what you are doing. Activities involving movement and music can be integrated into just about all other areas of learning in the early childhood and early years of education . It can be such an effective, enjoyable way of learning. Integrated learning is all about discovery, exploring, experiences and experimenting. Education trends today are becoming more child centred where the child shows an interest through an observation, free play, creation or discussion. The educator then extends that interest into valuable, well rounded, creative learning opportunities and experiences. Movement and music also allow for the development of the whole child...the physical, social, emotional, cognitive, intellectual and creative development. For example story reading, storytelling, art, craft, manipulative and fine motor activities, outside and inside play, language and numeracy development, construction, imagination and visualization, creativity, problem solving, choice making, social development and experiences, using props, making props, using musical instruments, making musical instruments, fine motor and gross motor activities, songs, chants and poetry can all become part of a child's learning and all triggered, integrated or extended from a single movement or music experience. The learning for the child is then hidden in the fun and participation, in many and varied experiences. The learning becomes whole! When children are having fun they don't realize they are learning! Your challenge as an educator is to be creative in your presentation and delivery of important learning skills. Children need to practise and repeat new and learned skills regularly, so again, be clever in planning your program and hide the learning in the fun and the variety of experiences offered to the children. The children will then stay interested and motivated! Educators should not feel compelled to constantly offer new activities to children but feel comfortable to repeat the same skill over and over but using a different approach. This is where you get creative in your delivery of activities so skills are practised and repeated. This is one of the tricks of great teaching! When skills are continually practiced a fine film called myelin (that covers the axon of the brain cell) starts to get thicker and strengthens. This allows messages from brain cell to brain cell to move faster. The faster the messages travel in the brain the better skilled and co-ordinated the body becomes! Research has shown that the brain is more receptive to picking up and retaining new information when there is no stress and it is an enjoyable experience! Practice and repetition of skills and activities not only enhances brain memory and functioning but also assists in developing muscle memory. The more a child skips or runs (for example), as part of a fun, enjoyable experience, game or activity, the more the muscles remember what they have to do...until the movement or skill becomes automatic. The movement or skill then also becomes more refined, co-ordinated and fluid. (Another simple example of this is when we drink a glass of water. Our arm knows exactly how to stop at the mouth because of all the practice we have putting a cup to the mouth and drinking. The arm does not take the cup to our shoulder or our nose but always to the mouth). You will notice young children use un-coordinated movements when they are learning to drink with a cup. That is because there is immature muscle memory and the brain has not fully developed in this young child yet! So to summarise...if you want a child to practice balance, vary the activities, don't just provide a balance beam for them to walk along. You can vary the heights of balance or balance in different positions and directions and on different equipment. The children can experience balance through games inside and outside the room. Remember also that balance is enhanced through the stimulation of the vestibular system so lots of spinning and rolling and rotation activities as well! Wow...that's a lot of ways to enhance balance! See more detail about the Vestibular System throughout the Lesson Plans and in the Brain - Body Connection section found in INFORMATION TOPICS. All pricing in Australian Dollars.